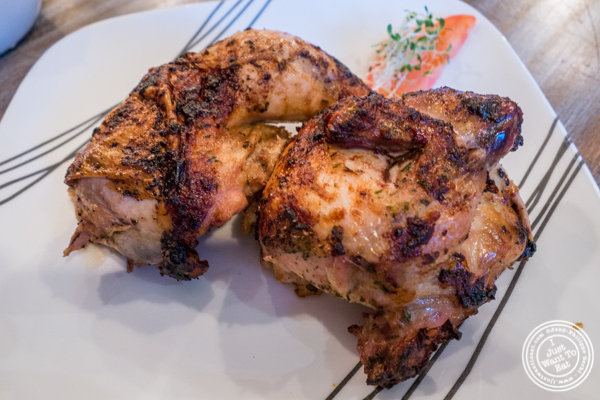 Food wise, it cater definitely to the chicken lovers, the vegetarians being left with sides. Of course they could ask for a salad without chicken that I am sure the staff would arrange without any issue. But yes, chicken and in different forms, combining the origin of the two owners, one being French (hence the rotisserie chicken) and the other one being from Virginia, bringing flavors from the South, not only with fried chicken, but also with items like jalapeño corn bread. A good corn bread for sure that, thankfully, did not have any heat. Fried chicken: although the coating was a bit overcooked and slightly hard, I enjoyed it, the chicken being perfectly cooked and moist. Rotisserie chicken: my favorite. The chicken was fantastic, also perfectly cooked and moist, with the skin that was crispy in some areas. There was definitely no need for any dipping sauce with it. Signature sandwich, made with a grilled chicken cutlet, romaine and iceberg lettuce, tomato, red onion, turkey bacon and Russian dressing. All of that in a toasted baguette. That was very good and I was glad that they were measured in the amount of ingredients accompanying the chicken, letting it shine. For sides, I tried the sweet potato fries (my favorite), the vegetable medley (I never thought I would say this, but I liked it) and the mash potatoes (my least favorite, too much garlic). But no dessert: they usually make a pie, but they were sold out. Well I will have to go back to try it, and not only this! Roast Homestyle Chicken is definitely a hole in the wall worth knowing and I am pleased I got to try it.